Located on the north coast of South America, Venezuela has a long coastline facing the Caribbean Sea. 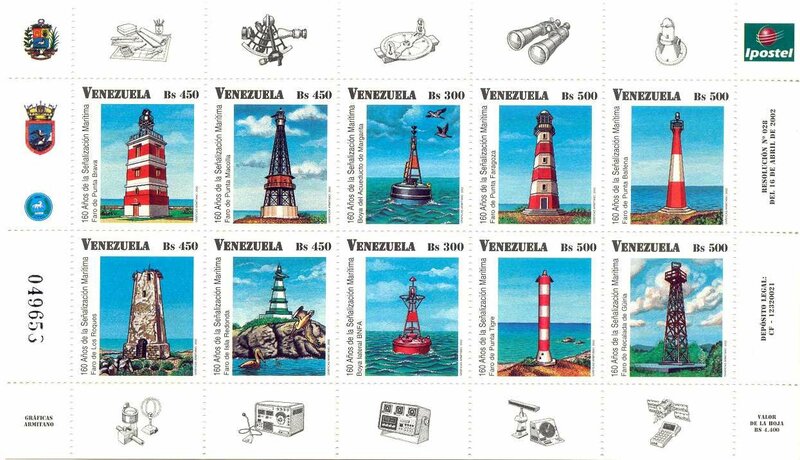 This page includes lighthouses of the western half of that coast, west of the La Guaira-Caracas area. In addition, Venezuela administers a number of islands in a westward extension of the Lesser Antilles chain. 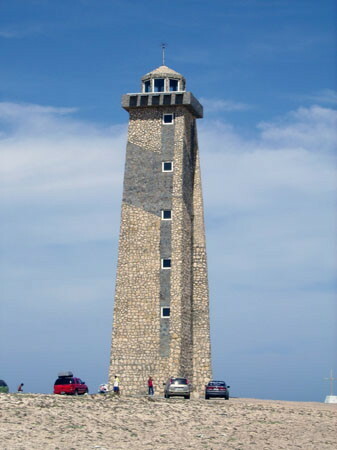 The lighthouses of the Isla Margarita and Venezuela's other Caribbean islands are listed on a separate page. Isla Aves, a remote Eastern Caribbean island claimed and occupied by Venezuela, also has a separate page. 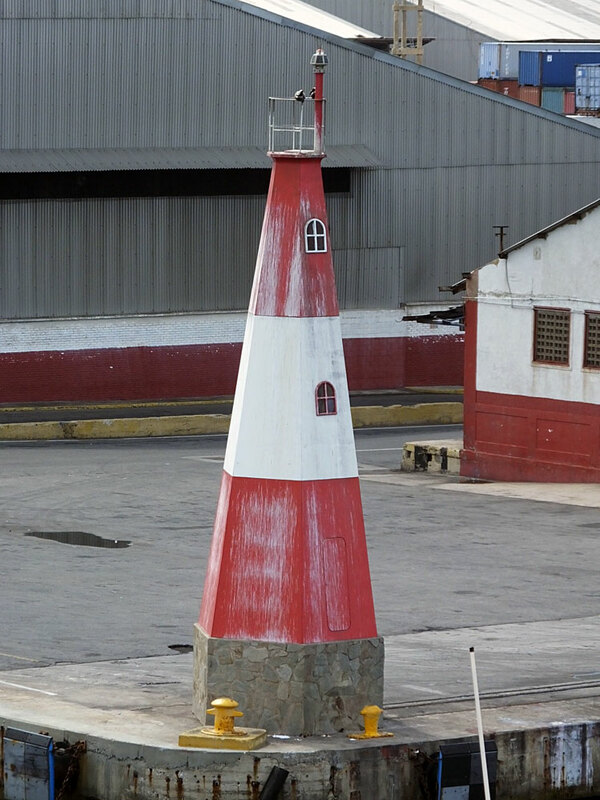 Only a small number of historic lighthouses remain in service in Venezuela, but there are many modern fiberglass or skeletal towers. Information on both active and inactive towers would be very welcome, and photos of many lighthouses are also needed. 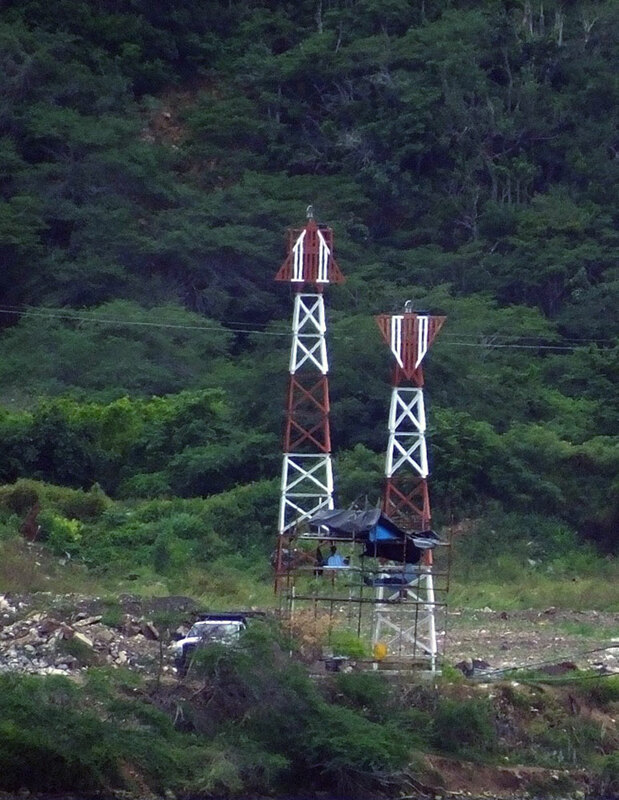 In recent years, Venezuela has been carrying out a program to build a number of new lighthouses; the Los Monjes light shown at right is an example of these new towers. 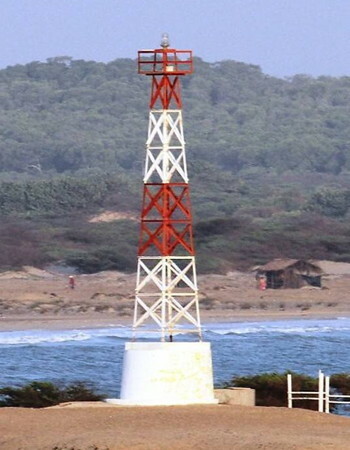 Active lighthouses in Venezuela are owned by the navy and managed by the Oficina Coordinadora de Hidrografía y Navegación (OCHINA). Special note: Following the election of President Nicolás Maduro in 2013 economic conditions in Venezuela deteriorated, leading to an outbreak of civil unrest. As of this revision (March 2019) the country is not safe for tourists and other visitors. Also, due to the breakdown in order the Directory's links to websites in Venezuela may not be working. Photos by various photographers posted by Alexander Trabas. The Venezuelan photos are mostly by Capt. Peter Mosselberger ("Capt. Peter") or Capt. Theo Hinrichs ("Capt. Theo"). Historic postcard images posted by Michel Forand. Navigational chart information for Venezuela. Note: The Los Monjes Islands are three small islands in the mouth of the Gulf of Venezuela about 50 km (30 mi) off the Colombian coast. The islands are barren and uninhabited. For administration they are included among the Dependencias Federales (Federal Dependencies), the territory that encompasses the many small Caribbean islands belonging to Venezuela. 1952. Inactive since 2003. Approx. 11 m (36 ft) round stone tower with gallery, painted with red and white horizontal bands. At some point the lantern was removed and the light was displayed from a short mast. 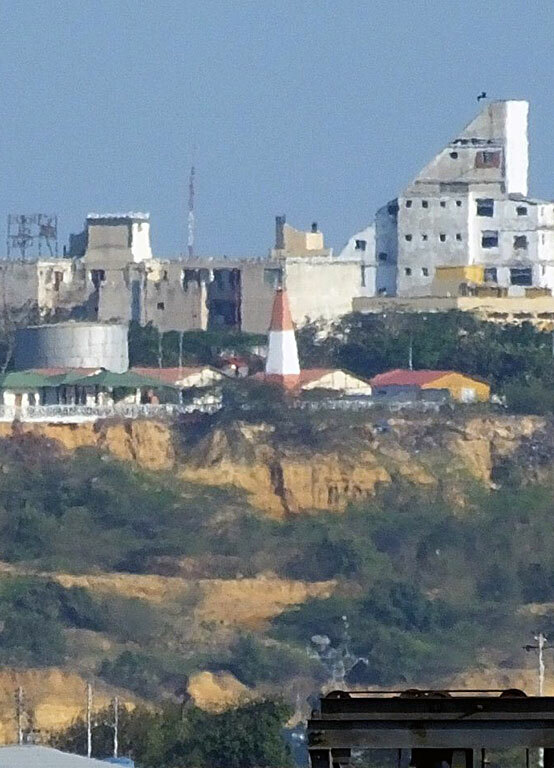 Venezuela built this lighthouse after Colombia issued a claim to the island. The old lighthouse has apparently been demolished. ARLHS VEN-034. 2003 (station established 1952). 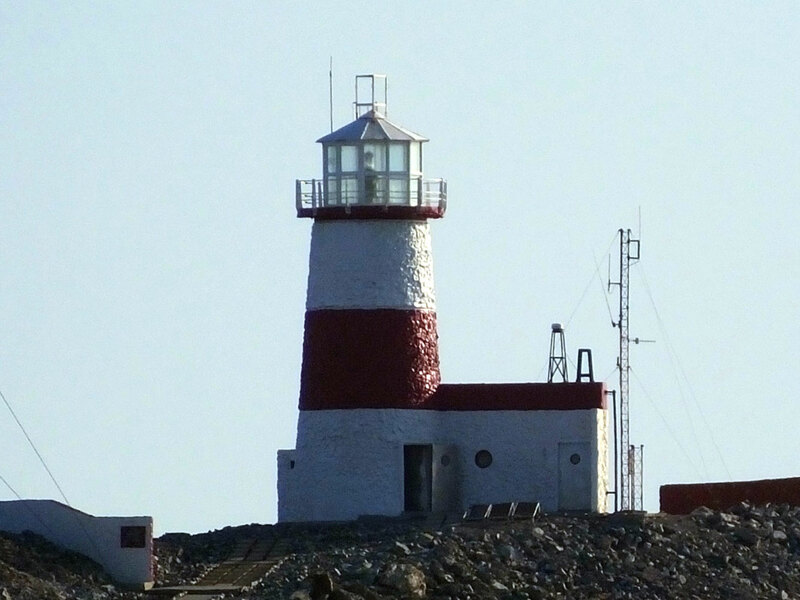 Active; focal plane 87 m (285 ft); white flash every 10.6 s. 13 m (42 ft) round rubblestone tower with lantern and gallery, painted white with a red horizontal band, attached to a 1-story service building. 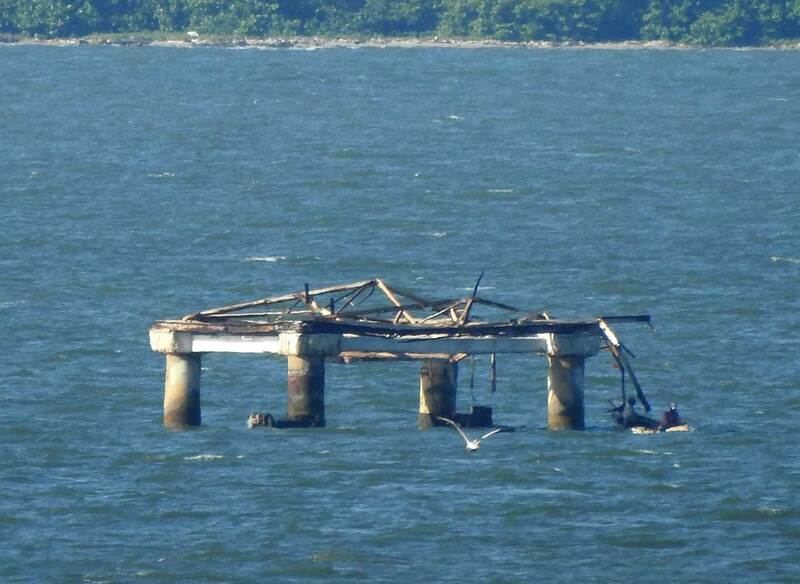 This station is staffed by the Venezuelan Navy. An OCHINA photo is at right, Trabas has Capt. Peter's closeup photo, Jesus Nones has a closeup photo, Wikimedia has a distant view by Rainer Radloff, and Bing has a satellite view. The light guides vessels entering the Gulf of Venezuela from the Caribbean Sea. Nones's view from the lighthouse shows how the two southernmost Monjes del Sur islets have been joined by a causeway and developed as a military outpost. Located at the summit of Los Monjes del Sur. Accessible only by boat. Site and tower closed; landing on the island requires permission of the navy. ARLHS-013; Admiralty J6270; NGA 16852. Note: Zulia is the state surrounding Lake Maracaibo, a brackish gulf connected by a narrow strait to the Gulf of Venezuela. A dredged channel has replaced the natural strait as the entrance to the lake for modern ships. To reach the port of Maracaibo, ships must cross a northern basin of the lake known as the Bahía de Tablazo. 2010 (station established 1980). Active; focal plane 26 m (85 ft); white flash every 15 s. 24 m (79 ft) square concrete tower with lantern and gallery. Angel Gonzalez has a 2016 photo and Google has a satellite view. A small skeletal tower was replaced by a fiberglass tower in 1993 and then in 2003 by a tall skeletal tower seen in the background of the construction photo. Located on a cape on the west side of the Gulf of Venezuela about 7 km (4 mi) south of the Colombian border. Site status unknown. ARLHS VEN-021; Admiralty J6269; NGA 16856. 2013 (station established 2005). Active; focal plane 24 m (79 ft); white flash every 10 s. 15 m (49 ft) square skeletal tower on a round concrete base. 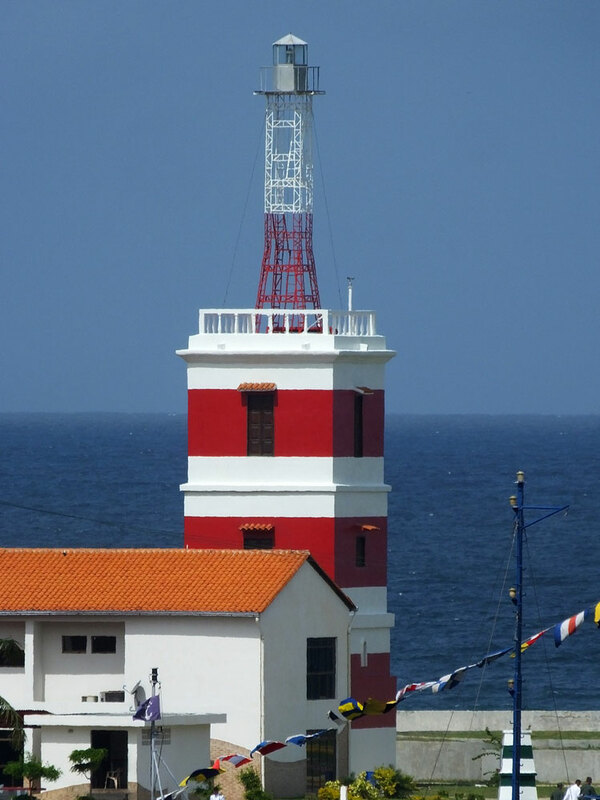 Lighthouse painted with red and white horizontal bands. Capt. Theo's photo is at right, Trabas has Capt. Peter's photo, and Google has a satellite view. 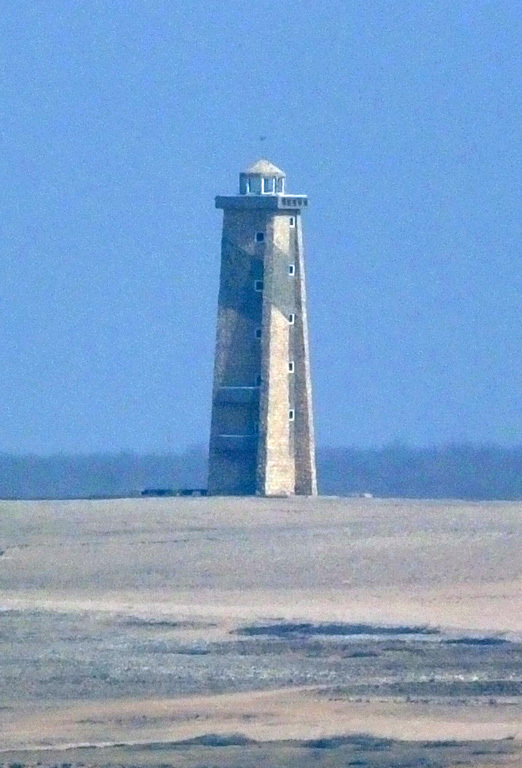 The 2005 lighthouse was a round fiberglass tower. 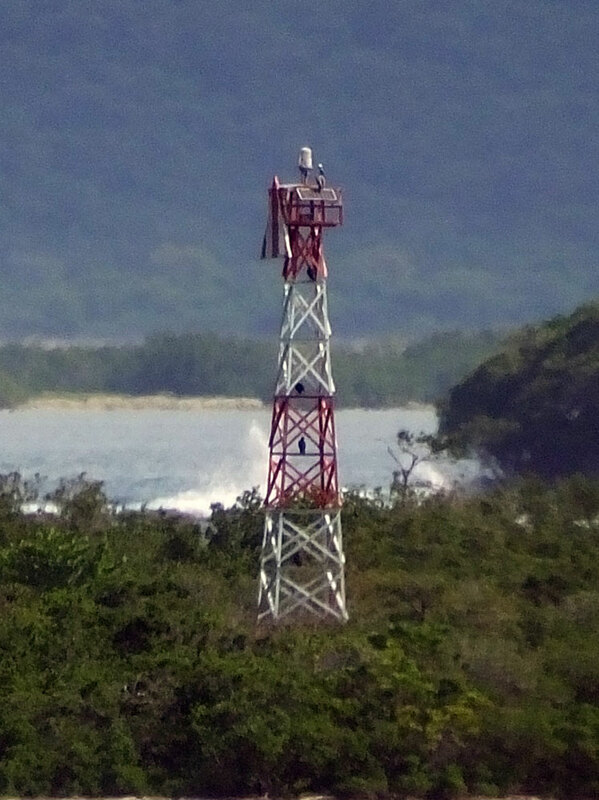 Like Monjes del Sur, this is one of a number of critical locations equipped with new light towers by the Venezuelan Navy. 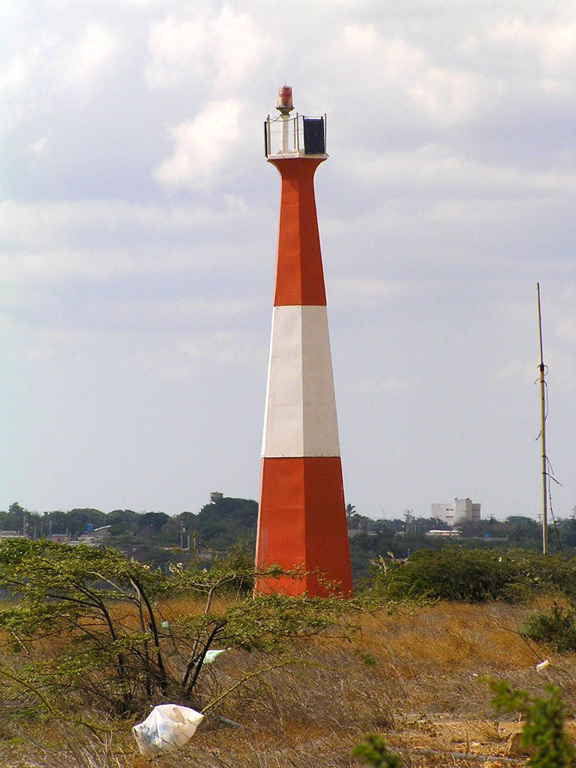 The lighthouse is actually located on the Isla de San Bernardo, which is tenuously connected to the mainland via the Isla San Carlos, marking the west side of the dredged entrance to the Lago de Maracaibo from the Gulf of Venezuela. Site status unknown. ARLHS VEN-001; Admiralty J6275; NGA 16860.2. Date unknown. Inactive but listed with focal plane 14 m (46 ft); white flash every 5 s. 7 m (23 ft) round rubblestone tower. Trabas has Capt. Peter's photo, and Bing has an indistinct satellite view. The photo also shows a round conical tower, but no light is visible on either tower. Located on the breakwater on the east side of the dredged entrance to the Lago de Maracaibo from the Gulf of Venezuela. Site status unknown. ex-Admiralty J6274; NGA 16860. Date unknown. 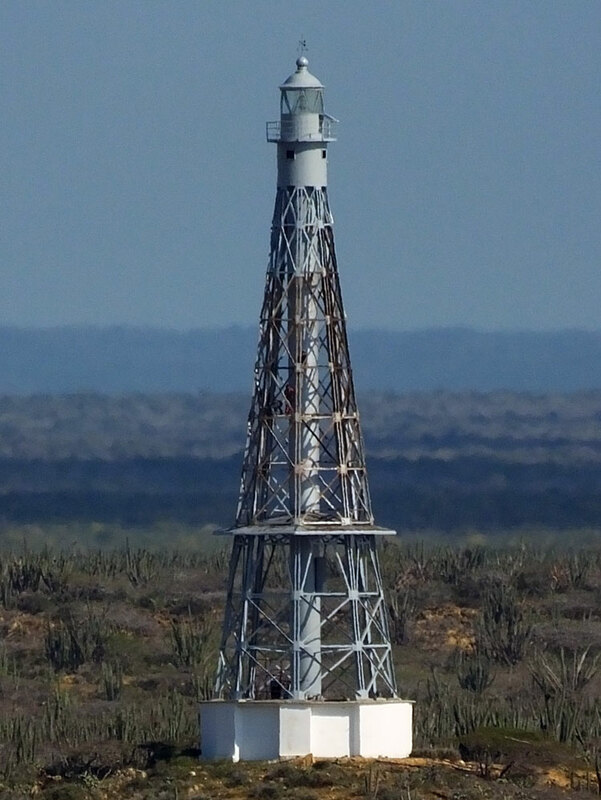 Inactive but listed with focal plane 42 m (138 ft); green flash every 4 s. 39 m (128 ft) square pyramidal skeletal tower, mounted on a square platform supported by piles. The tower appears abandoned in Capt. Peter's photo. Google has a satellite view. This was an outbound (northbound) range for vessels leaving Maracaibo. Another photo by Capt. Peter shows that the former front light has vanished. Located in the upper Lago de Maracaibo about 8 km (5 mi) east of Las Delicias. Accessible only by boat. Site open, tower closed. Admiralty J6283.1; NGA 16873.1. Date unknown. Inactive but listed with focal plane 27 m (89 ft); green flash every 1.5 s. 27 m (89 ft) square pyramidal skeletal tower, mounted on a square platform supported by piles. Trabas has Capt. Peter's photo of the abandoned tower and Google has a satellite view. This was an inbound (southbound) range for vessels entering Maracaibo. At one time the rear light was on one of the electric transmission line towers crossing the lake just north of the city of Maracaibo. Located 1.65 km (1 mi) north of the transmission line. Accessible only by boat. Site open, tower closed. Admiralty J6279.9; NGA 16872. Date unknown. Inactive but listed with focal plane 39 m (129 ft); green flash every 1.5 s. This was a 27 m (89 ft) square pyramidal skeletal tower, mounted on a square platform supported by piles. The tower appeared abandoned in an earlier photo by Capt. Peter and the tower is gone in his more recent photo. Google has a satellite view. 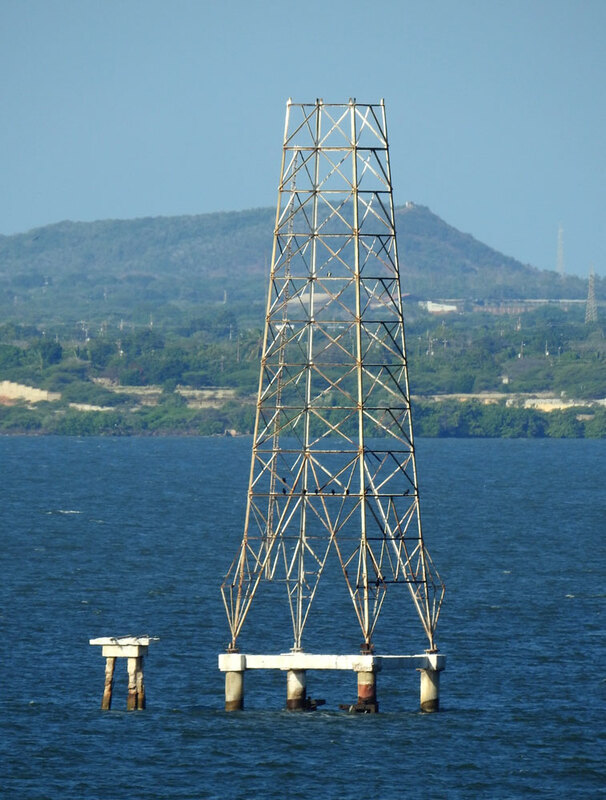 Located just to the south of electric transmission line towers crossing the lake just north of the city of Maracaibo. Accessible only by boat. Site open, tower closed. Admiralty J6280; NGA 16872.1. Date unknown (station established 1938). 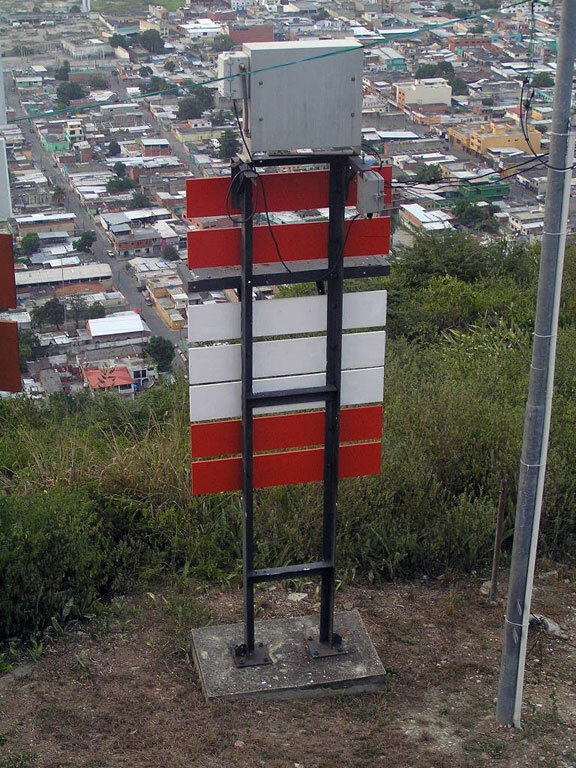 Active; focal plane 15 m (49 ft); white flash every 4 s. 10 m (33 ft) hexagonal tower, painted red with a white horizontal band. Trabas has Capt. Theo's photo and Google has a satellite view. Located on a quay in Maracaibo. Site status unknown. Admiralty J6287; NGA 16873.83. Date unknown. Active; focal plane 15 m (49 ft); white flash every 10 s. 12 m (39 ft) orange and white fiberglass tower. No photo available but Google has an indistinct satellite view. Located at Moporo, a town on the east coast of Lake Maracaibo. Site status unknown. Admiralty J6294; NGA 16875.5. Note: The large state of Falcón includes the east side of the Gulf of Venezuela and the bulbous Paraguaná Peninsula, the northernmost extension of the Venezuelan mainland. The peninsula is almost an island, being connected tenuously to the mainland by the narrow Isthmus of Médanos. Date unknown. Active; focal plane 15 m (49 ft); one long (1.2 s) white flash every 12 s. 15 m (49 ft) round cylindrical fiberglass tower, painted with red and white horizontal bands. No photo available but Google has a satellite view. Located on a sandy point of land on the south side of the Gulf of Venezuela. Site status unknown. Admiralty J6297; NGA 16875. Date unknown. Active; focal plane 36 m (118 ft); two long (1.5 s) flashes every 12 s, red or green depending on direction. 10 m (33 ft) hexagonal fiberglass tower, orange with one white horizontal band. Trabas has Capt. Peter's photo, Daniel Lopez Martinez has a photo, and Google has a satellite view. The green sector guides vessels entering the Guaranao harbor on the south side of Punto Fijo, a city at the southwestern corner of the Paraguaná Peninsula. Located on a bluff overlooking the south side of the harbor and city. Site appears open, tower closed. Admiralty J6299; NGA 16879.7. Date unknown. Active; focal plane 40 m (131 ft); one long green flash every 10 s. 10 m (33 ft) hexagonal fiberglass tower, colored orange with one white horizontal band. Trabas has Capt. Peter's distant view from the sea and Google has a satellite view. Located in the Venezuelan Navy's Base Naval Falcón in Punto Fijo. Site and tower closed. Admiralty J6300.4; NGA 16890. 1988 (station established 1927). Active; focal plane 48 m (157 ft); white flash every 10 s. 41 m (135 ft) octagonal cast iron skeletal tower with central cylinder, lantern, and gallery mounted on a concrete base. An octagonal 1-story keeper's quarters with wood siding is incorporated in the tower. Daniel Bertoni's photo is at right, Andres Figueira has a fine closeup, Trabas has Capt. Peter's view from the sea, Wikimedia has Elias Rodriguez Azcarate's view, and Google has a good satellite view. 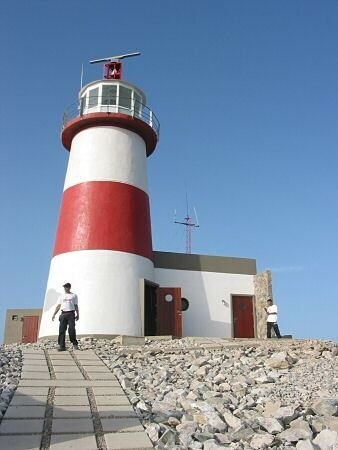 The original lighthouse was badly deteriorated by the 1980s, so a copy of it was built in 1988 to replace it. It is said that the Dutch island of Aruba can be seen from the base of the lighthouse. Located on the north coast of the Paraguaná Peninsula. Accessible by hiking trail. Site open, tower closed. ARLHS VEN-018; Admiralty J6312; NGA 16896. Around 2004 (station established 1928). Active; focal plane 34 m (112 ft); white flash every 6 s. 24 m (79 ft) square stone tower with lantern and gallery; the walls of the lighthouse are extended so that the tower has a trapezoidal profile. An OCHINA photo is at the top of this page, Javier Heredia has a photo, Rahuld Barraez D'Lucca has a fine closeup, José Jaime Araujo also has a good photo, Trabas has Capt. Peter's photo, and Google has a closeup street view and a good satellite view. 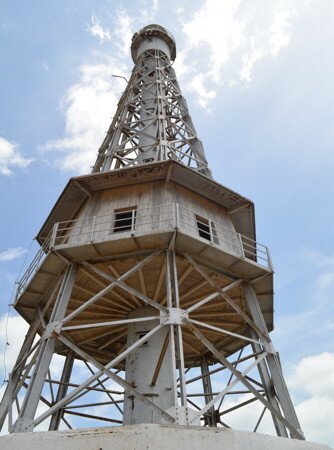 The original 9 m (30 ft) tower was replaced during World War II by a short skeletal tower; higher skeletal towers were built in 1975 and in 1997. In clear weather the new lighthouse is distantly visible from Aruba. 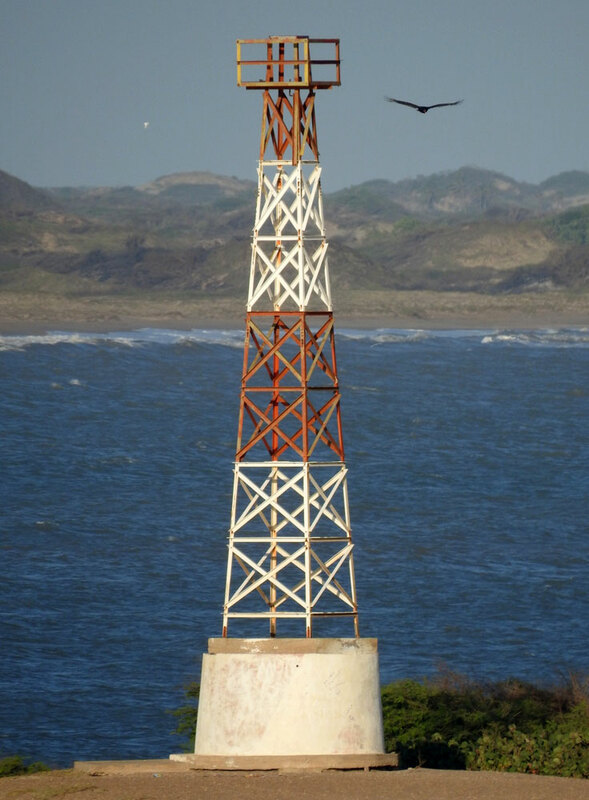 Located on the beach at the northernmost point of the Paraguaná Peninsula. Site open, tower closed. ARLHS VEN-024; Admiralty J6314; NGA 16900. Date unknown (station established 1931). Active; focal plane 17 m (56 ft); white flash every 16 s. 17 m (56 ft) round fiberglass tower with hexagonal lantern and gallery, mounted on a round stone base. Tower painted with red and white horizontal bands; gallery painted with red and white horizontal bands. A photo is at right, José Cherubini has a photo, Ángel Ravelo Rodríguez has a nice photo, an excellent closeup is available, the Navy has a photo, Wikimedia has a closeup, and Google has a satellite view. The original light was on a 12 m (39 ft) skeletal tower. Located on a point of land in the beach resort town of Adícora, on the east side of the Paraguaná Peninsula. Site open, tower closed. Admiralty J6428; NGA 16904. Date unknown. (station established 1931). Active; focal plane 59 m (194 ft); white flash every 7 s. Approx. 12 m (39 ft) hexagonal metal tower, colored orange with one white horizontal band. The Navy has a photo, Sergio González has a photo, and Google has a satellite view. Located on a rugged cape about 15 km (9 mi) northeast of La Vela de Coro. Site status unknown. Admiralty J6434; NGA 16912. Date unknown. Active; focal plane 45 m (148 ft); white flash every 6 s. Approx. 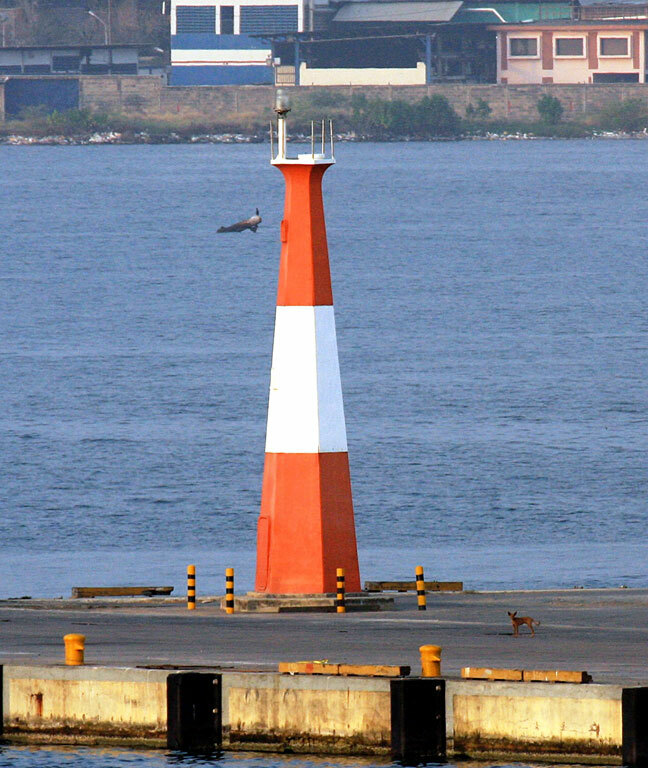 12 m (39 ft) hexagonal fiberglass tower, colored orange with one white horizontal band. The Navy has a photo but the lighthouse is not conspicuous in Google's satellite view. Located on a prominent cape about 15 km (9 mi) northeast of Puerto Cumarebo. Site status unknown. Admiralty J6438; NGA 16920. Date unknown. Active; focal plane 16 m (52 ft); white flash every 10 s. 12 m (39 ft) round cylindrical fiberglass tower colored with orange and white horizontal bands. OCHINA has a photo and Bing has a satellite view. Located on Punta Zamuro near the village of San José de la Costa. Site status unknown. Admiralty J6440; NGA 16924. Date unknown. Active; focal plane 50 m (164 ft) (? ); one long white flash every 15 s. 12 m (39 ft) round cylindrical fiberglass tower colored with orange and white horizontal bands. No photo available but Google has a distant satellite view. Located on a promontory near the village of Aguide. Site status unknown. Admiralty J6441; NGA 16928. Date unknown. Active; focal plane 15 m (49 ft); white flash every 6 s. 12 m (39 ft) round fiberglass tower, painted with orange and white horizontal bands. No photo available but Bing has a distant satellite view. The lighthouse replaced a square skeletal tower. Located on a small cay about 6 km (3.5 mi) northeast of Los Boquerones. Accessible only by boat. Site status unknown. Admiralty J6442; NGA 16932. Date unknown (station established 1930). 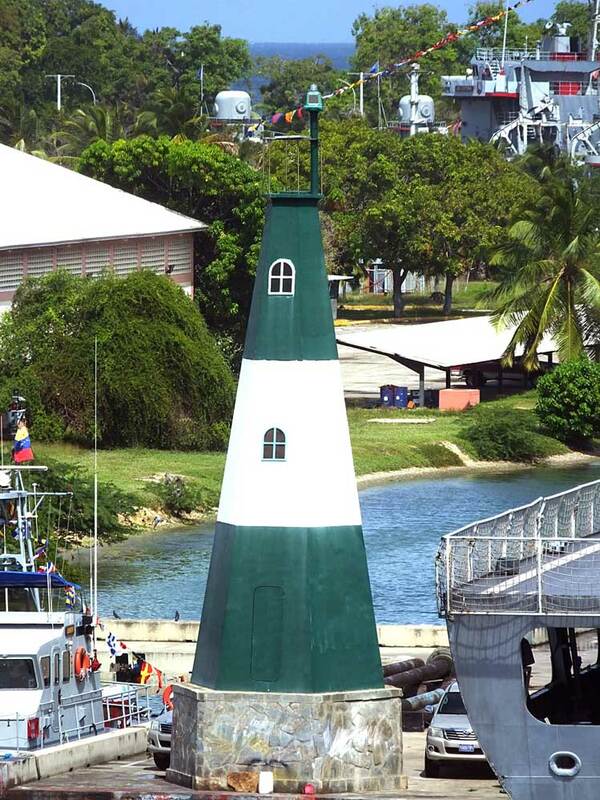 Active; focal plane 16 m (52 ft); white flash every 8 s. 14 m (46 ft) round fiberglass tower with octagonal lantern and gallery. Tower painted with red and white horizontal bands; gallery painted with vertical red and white stripes. 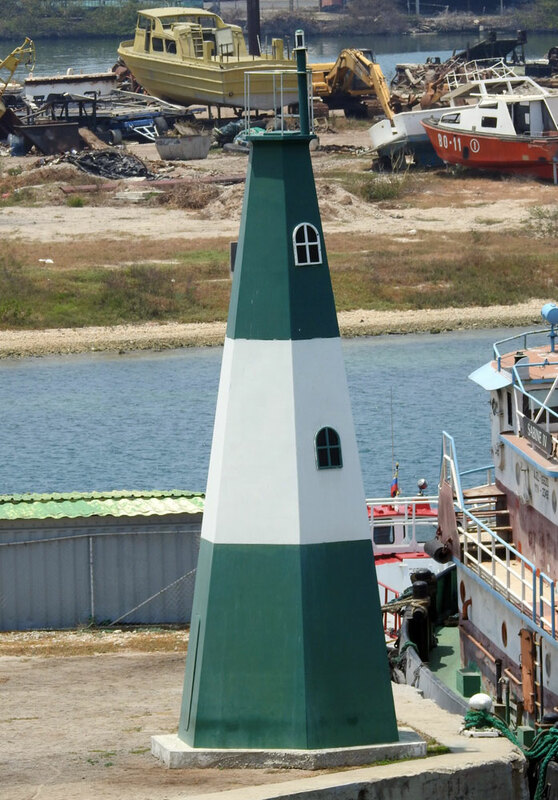 This lighthouse is a twin of the Isla Chimana Segunda light pictured below. An aerial photo is at right, Trabas has Capt. Theo's distant view, Cristian Bracci has a distant view from the sea, and Google has a satellite view. The original light was replaced in 1937. 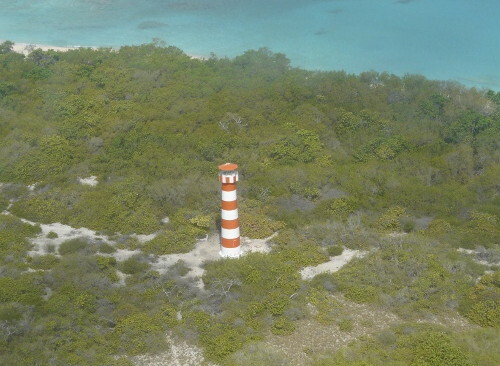 Located on a small cay about 15 km (9 mi) north of Chichiriiviche. Accessible only by boat. Site and tower closed. Admiralty J6444; NGA 16936. Date unknown. Active; focal plane 13 m (43 ft); white flash every 8 s. 12 m (39 ft) hexagonal pyramidal tower, painted with orange and white horizontal bands. Trabas has Capt. Peter's photo and Bing has an indistinct satellite view. Located on a small cay about 3 km (2 mi) west of the entrance to Puerto Cabello. Accessible only by boat. Site status unknown. Admiralty J6448.4; NGA 16956. Date unknown. Active; focal plane 168 m (551 ft); three white flashes every 15.5 s. Listed as a 6 m (20 ft) skeletal tower, painted white. In June 2012, Capt. Peter Mosselberger visited the fort and found the light to be at the top of the lower of two slatted daymark panels, each painted red with a white horizontal band and mounted on posts below the wall of the fort. Trabas has his photo and Pedro Ocariz has a beautiful street view that shows both the light and the view, but the light is not seen in Google's satellite view of the fortress. The Fortín Solano, built starting in 1766, is one of the best-preserved colonial-era fortifications in Venezuela. Antonio Rojas has a photo of the fortress. Located on a high ridge overlooking Puerto Cabello. Site and fortress open. Admiralty J6447; NGA 16976. 2006-07. Active; focal plane 16 m (52 ft); red flash every 6 s. 14 m (46 ft) hexagonal pyramidal fiberglass tower, mounted on a masonry base. Lighthouse painted red with one white horizontal band. Trabas has Capt. Peter's photo (a slightly different view is seen at right) and Bing has a satellite view. Located at a corner of the commercial quays directly opposite the Naval Quay light. Site status unknown. Admiralty J6449.5; NGA 16961.3. 2006-07. Active; focal plane 16 m (52 ft); red flash every 9 s. 12 m (39 ft) hexagonal pyramidal fiberglass tower, mounted on a masonry base. Lighthouse painted red with one white horizontal band. Trabas has Capt. Peter's photo and Bing has a satellite view. Located at a corner of the commercial quays about 1 km (0.6 mi) southeast of the Pier M-7 light (previous entry). Site status unknown. Admiralty J6449.7; NGA 16961.7. Date unknown. Active; focal plane about 18 m (59 ft); white flash every 3 s. Approx. 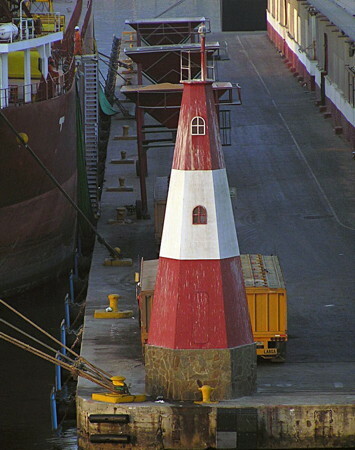 15 m (49 ft) square skeletal tower, painted with red and white horizontal bands and carrying a triangular slatted daymark painted with red and white vertical stripes. Trabas has Capt. Peter's photo and Bing has a satellite view. Located on the shoreline at the extreme southeastern end of Puerto Cabello's harbor. Site status unknown. Admiralty J6451; NGA 16965. Date unknown. Active; focal plane about 23 m (75 ft); white flash every 3 s. Approx. 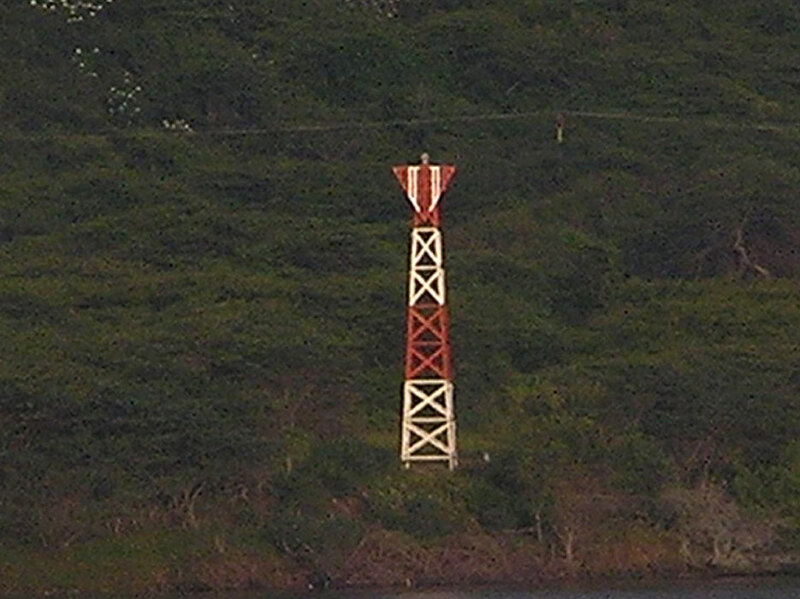 15 m (49 ft) square skeletal tower, painted with red and white horizontal bands and carrying a triangular slatted daymark painted with red and white vertical stripes. Trabas has Capt. Peter's photo and Bing has a satellite view. Located on the shoreline at the extreme southeastern end of Puerto Cabello's harbor. Site status unknown. Admiralty J6451.1; NGA 16966. 2006-07. Active; focal plane 16 m (52 ft); green flash every 6 s. 14 m (46 ft) hexagonal pyramidal fiberglass tower, mounted on a masonry base. Lighthouse painted green with one white horizontal band. The Navy has a photo, Trabas has Capt. Peter's photo and Bing has a satellite view of the quay. This light was reportedly replaced with a smaller tower in 2011 but it seems to be present in more recent satellite photos. Located at the southwest end of the main navy pier at Puerto Cabello. Site and tower closed. Admiralty J6449; NGA 16961. Date unknown. Active; focal plane 13 m (43 ft); green flash every 4 s. 11 m (36 ft) hexagonal pyramidal fiberglass tower, mounted on a masonry base. 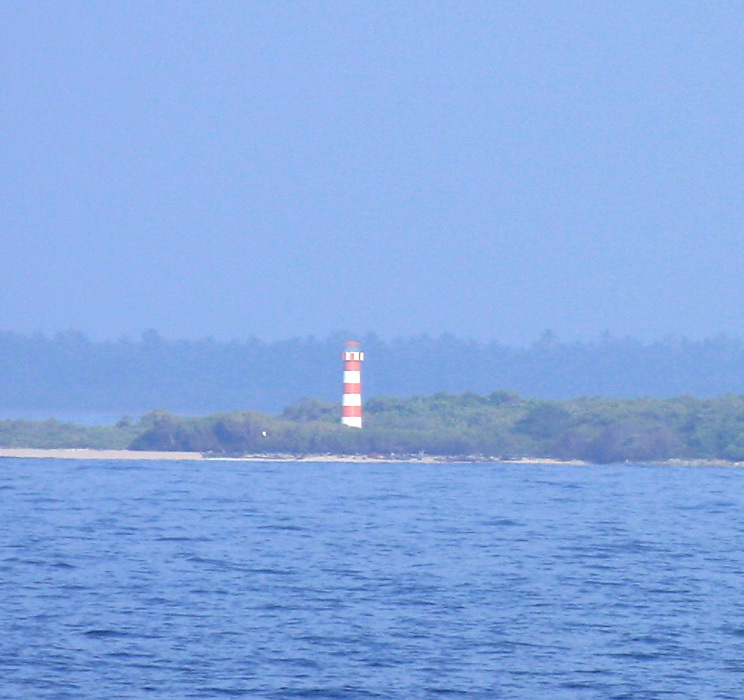 Lighthouse painted green with one white horizontal band. Trabas has Capt. Peter's photo and Google has a satellite view of the quay. Forand has a postcard view of an earlier tower on this quay, a tall skeletal tower. 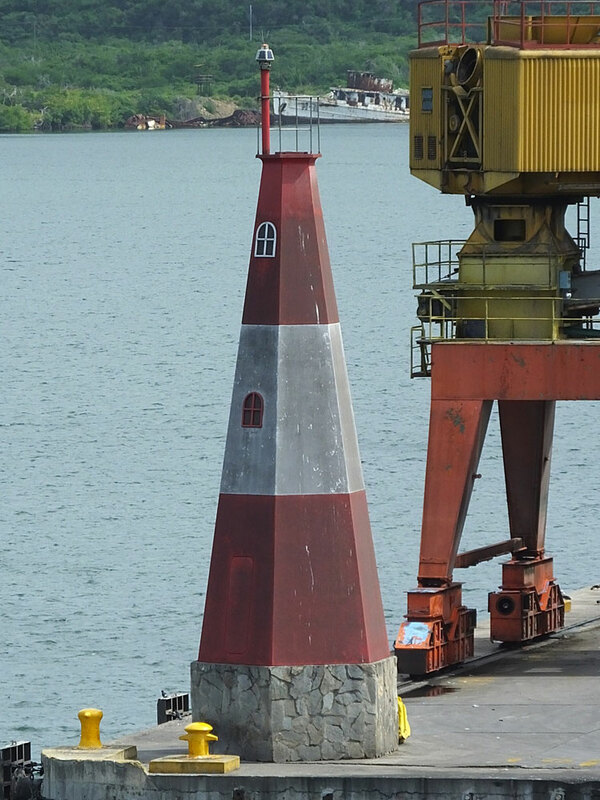 Located at the southwest end of the main navy pier at Puerto Cabello. Site and tower closed. Admiralty J6448.7; NGA 16959. 1901 (station established 1864). Active; focal plane 37 m (121 ft) (? ); white flash every 10 s. Approx. 24 m (79 ft) square 4-story concrete tower topped by a square skeletal tower with lantern and gallery. 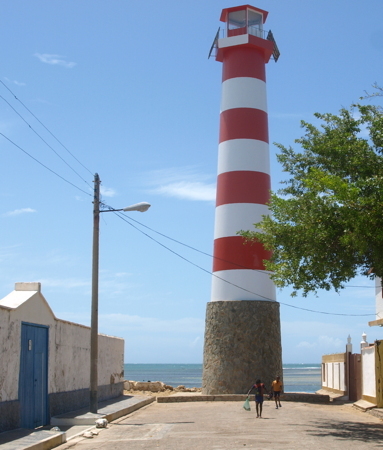 Lighthouse painted with horizontal red and white bands. Trabas has Capt. Peter's photo (also seen at right), a 2002 postage stamp shows the lighthouse, Michel Forand has a 1910 postcard view, and Google has an excellent satellite view. Huelse also has a historic postcard view. This is Venezuela's oldest light station. The lighthouse was destroyed by a disastrous fire in October 1892; it was replaced by a light on a mast until the new lighthouse was built. The skeletal tower atop the building has been replaced several times, and its varying heights have changed the focal plane. For a time the focal plane was listed as 50 m (164 ft). NGA lists the current tower height as 37 m (121 ft), which still seems too high. In 2005 the Navy established its hydrographic research station in a modern building at the base of the lighthouse. Located on a headland just north of Puerto Cabello, the major port of northwestern Venezuela. Site and tower closed (naval installation). Site manager: Estación Hidrográfica de Puerto Cabello. ARLHS VEN-027; Admiralty J6448; NGA 16964. 2011 (?). Active; focal plane 19 m (62 ft); white flash every 10 s. 15 m (49 ft) tower, listed as an orange fiberglass tower with a white band. However, Trabas has Capt. Peter's photo showing a square skeletal tower painted with red and white horizontal bands. Google has an indistinct satellite view. Located on the northwest corner of an island about 4 km (2.5 mi) northeast of Puerto Cabello. Accessible only by boat. Site status unknown. Admiralty J6452; NGA 16960. Date unknown. Active; focal plane 15 m (49 ft); green light, 3 s on, 4 s off. 13 m (43 ft) hexagonal skeletal tower, painted green with a white horizontal band. No photo available but Google has a distant satellite view. The Bahía de Turiamo is a well-protected natural harbor about 20 km (13 mi) east of Puerto Cabello. 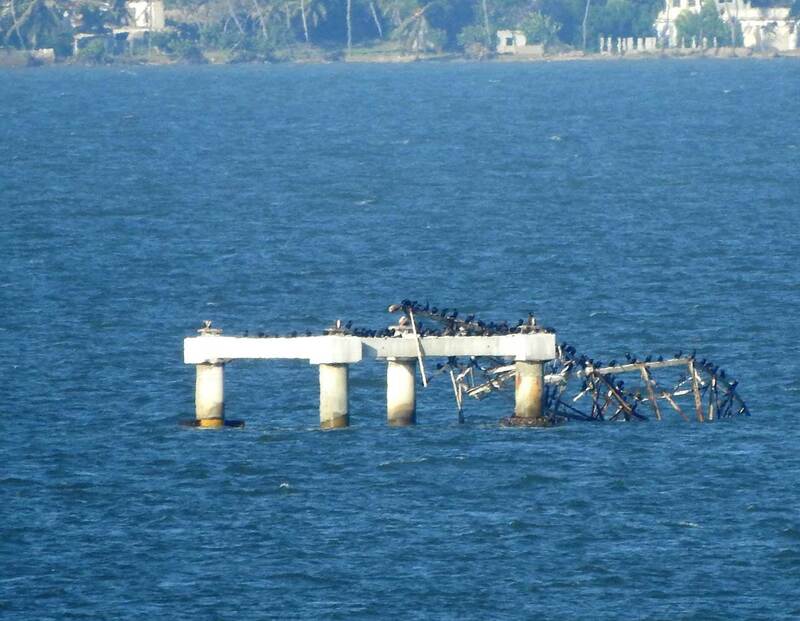 Located at the north end of the quay at a Venezuelan Navy station on the east side of the bay. Site and tower closed. Admiralty J6453; NGA 16992. Date unknown. 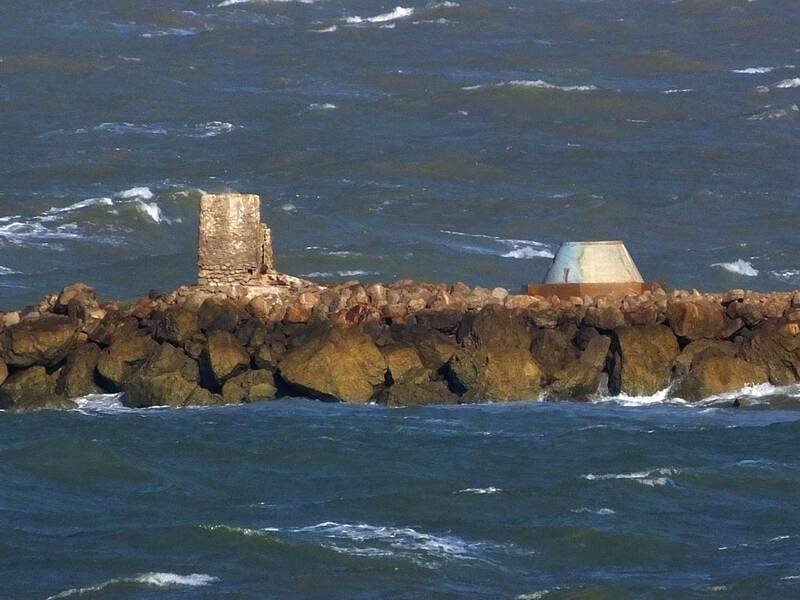 Active; focal plane 106 m (348 ft); white flash every 5 s. 6 m (20 ft) square tower on a structure resembling a small boat. Building painted orange with one white horizontal band. Mafy Garcia has a photo, Jesús Ortiz Buhrkohl has a closeup photo, and Google has an indistinct satellite view. Located atop a very steep headland about 90 km (55 mi) west of La Guaira. Accessible by a hiking trail. Site open, tower closed. Admiralty J6453.4; NGA 16996. Puerto Cumarebo (1932-? ), Falcón. This interesting 3-story masonry lighthouse was dropped from the Admiralty list in 2006 but the evidence suggests that it disappeared much earlier. Apparently it does not survive. ARLHS VEN-026; ex-Admiralty J6436; ex-NGA 16916. Punta Adaro (1948-? 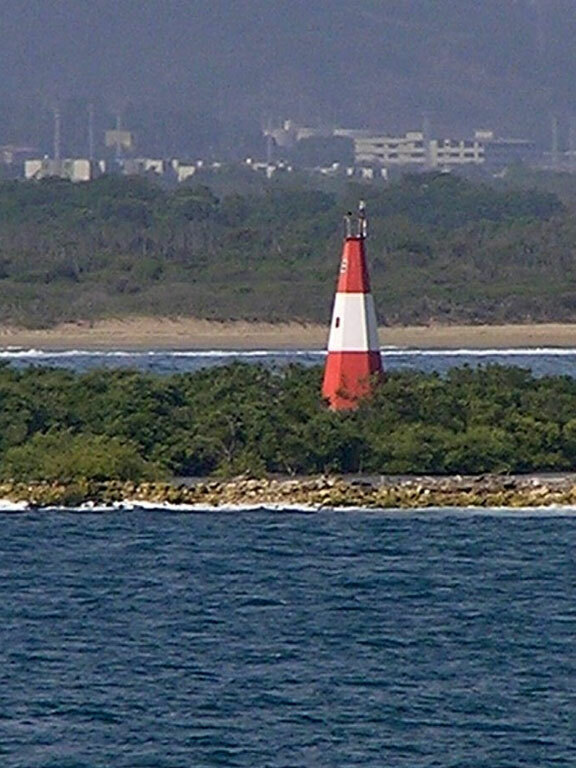 ), Falcón north of Punto Fijo. ARLHS VEN-038. Posted July 7, 2003. Checked and revised March 13, 2019. Lighthouses: 33. Site copyright 2019 Russ Rowlett and the University of North Carolina at Chapel Hill.